These biscuits are an occasional, special treat. They are loaded with cream but very light, fluffy, and delicious–perfect for strawberry, peach, or mixed-berry shortcakes. The biscuits can also be used as a topping for cobblers. You can reduce a bit of the flour and add in some cornmeal for a sweet, textural change as well. You can sprinkle the top with white, cinnamon, or turbinado sugar. On their own they make a fine breakfast, spread with a bit of your favorite jelly or jam. The recipe is adapted from the Gourmet Magazine Cookbook. Preheat oven to 425 degrees. Line two baking sheets with parchment paper. In a large mixing bowl sift together flour, baking powder, and salt. Add 1/2 cup sugar and stir to mix. Make a well in the center and, using a fork, slowly pour in the cream. Stir until you have a crumbly dough. Turn out onto a very lightly floured surface and roll dough with a rolling pin to 3/4 inch thickness. You don’t want the dough thin. Cut out into circles with a cookie cutter. You should have about 14 biscuits after the first rolling-out of the dough. Gather the scraps and piece them together with your hands. Don’t use a rolling pin this time. Cut out 10 more biscuits. Place biscuits 12 per cookie sheet. Brush each biscuit with cream, then sprinkle with a little sugar. 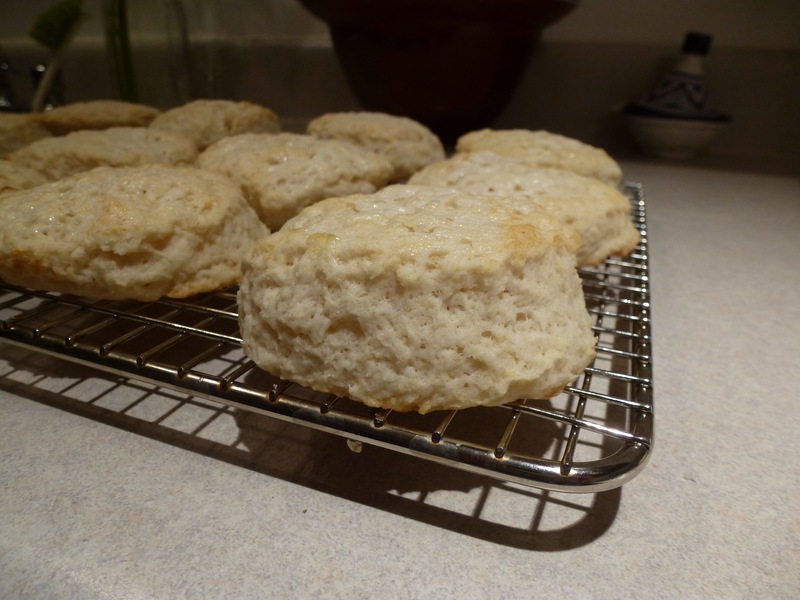 Bake 10-12 minutes, rotating halfway through baking, until biscuits are puffed and very light golden on top. Cool on rack. Makes 24 biscuits. This entry was posted in Breads, Breakfast, Christmas, Desserts. Bookmark the permalink.